This will allow you to see all of the planned or completed data for any date. Planned and completed events are shown. Click on an event (blue event name) to open it. If the event was scheduled and is marked as "Planned" ( a draft event). Complete the event, and click on the "Save and Close" button. The information will be saved a completed, and this event will then be saved on your records, and only coach with access to this information will be able to access these results. If you select to save and close the event, you will be taken to the Athlete History page to see their results. 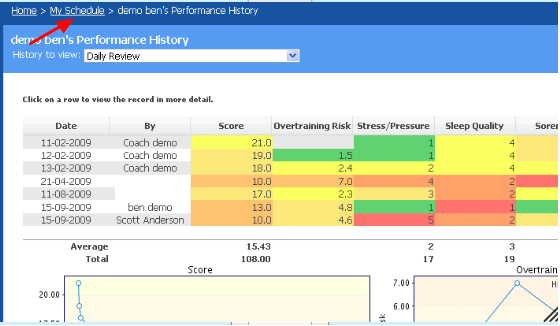 If you selected to enter data into your event and then "Save and Close "it, the system will automatically take you to the Athlete's history page. You will be able to see how the new entry compares with any other information that has been entered on the system for this type of event (e.g. Daily Review). 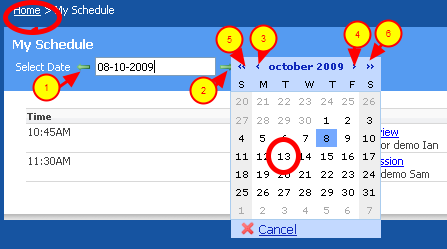 Alternatively, click on the date box and a calendar will appear for you to choose a date. Use the small blue < and > arrows to skip between months (#3 and #4), and the << and >> (#5 and #6) to skip between years. When you have found the correct date, click it. Any events scheduled for the selected day will be shown. 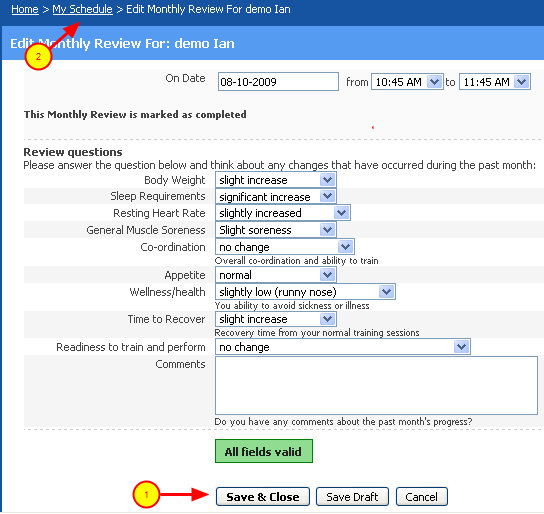 When you are finished using the Schedule, click the Home link as shown in the image above to be taken back to the Home page.